This is half the price the Panasonic Four Thirds adapter goes for, I'd be interested in how its machining tolerances compare. The Panasonic adapter has excellent infinity focus registration, but does have a slight bit of rotational play. Have anyone tried this?... I'm thinking about buying one, but I'm not sure whether it will work or whether the quality is any good. I had bought one to use with 4/3 Zuiko 9-18mm and it is useless, a lot of soft edges but I think that it can be used with not so wide lenses. What? This adapter has no glas elements, how does it make "soft edges"? 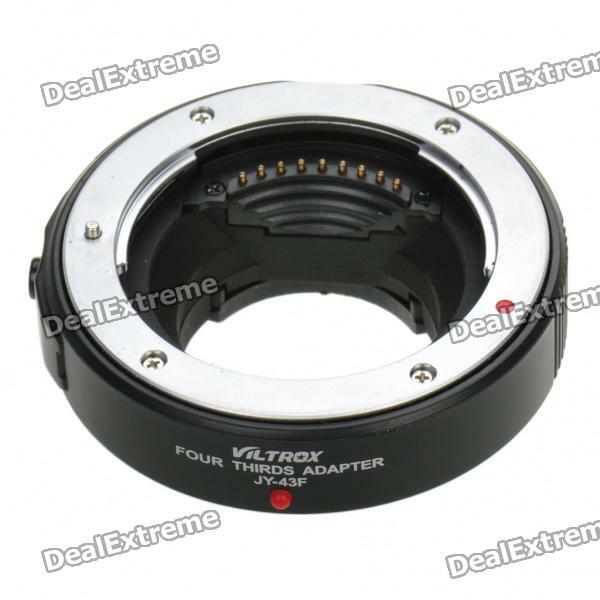 I just bought a used Mark ONE Olympus 14-54mm F2.8-3.5 for half what the used Mark II are going for and bought one of these adapters. Here's some pics of the front, back and on cam. The Mk1 don't have auto focus on the new GHs, but shutter and aperture control works and aperture priority mode works, but it's 3 times as slow as the stock 14-42 kit lens. For some of the newer Four Thirds lenses, this should work. Here's some pics. I asked for a black one and they sent a silver, so I'm sending this back tomorrow for a black one. EDIT: Had a spotty wifi and accidentally double posted the on picture and won't let me delete one. Added some more info. The adapter looks good. Metal lens mount points but the silver part, the part that has Viltrox JY-43F written on it...it doesn't feel like metal, but doesn't feel plasticy either. It is plastic in the middle black interior, but for $60 bucks on ebay, good deal IMHO. Ok, got the black one in, and it won't autofocus on the GH1, but it will auto focus on the GH2 when you hit the AF/AE lock button but I can't figure out how to get it to AF with the half shutter press, but then I'm not sure if it can. It does AF way slower than even the stock 14-42mm. The stock kit lens AF almost instantly, but the Olympus 14-54mm Mk1 takes around 2-3 seconds. but the Olympus 14-54mm Mk1 takes around 2-3 seconds. It is pretty ok for this lens. They are not made for contrast AF. I have this adapter. Was loose on the mount. I ended up springing for the Olympus MMF-2 and couldn't be happier. @RatLabProductions The silver one I had and this one are nice and tight, but the silver was REAL tight. The black one is not as tight as the silver but still fairly solid against the camera and lens. This implies that there could be quite a large margin from adapter to adapter. I ordered from a U.S. Seller that exchanged the silver for black so if you go for this adapter, try and get one from your nation or a seller that will exchange. You can fix most of adapters in a minute, we have a topic on this. anybody tried this with a Olympus 12-60 and a GH3? Anybody got any adapter with this lens and camera combo and had success?